I'm not a pattern person, my wardrobe is mainly built with solid blocks of colour: black, brown, navy blue, and gray. But if you peer close enough you'll see I have a fondness for polka dots. Admittedly, spots can come across as a little childish but paired correctly they can be cute without being creepy. Stripes just don't do it for me. They're not fun the way polka dots are. 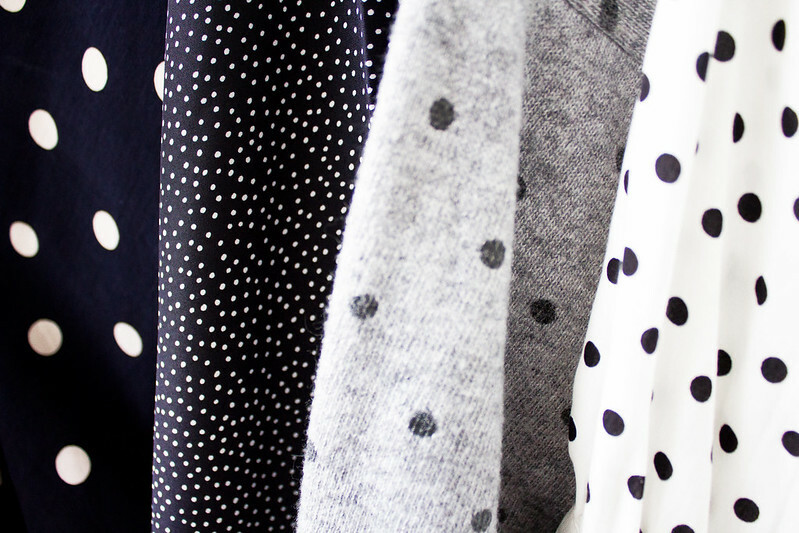 Spots will always be > stripes. Definately agree with spots over stripes! Although I think I have even quantities of both in my wardrobe. I am so with you, I must have at least 10 pieces of clothing with spots! Stripes will come and go, but spots are forever. Stripes all the way. I'm just not a spots person at all, haha! Your new design is great! Although I do think that your last one was a little more unique. Love the new layout. I want your wardrobe. ps i want that grey sweater! I'm a stripes kinda girl but these lovely pieces may have just given spots a place in my heart! I dig the dots but I love a black and white stripe. I love the new design... Anyway, I love polka dots and stripes at the same time, although your polka dots shirts look great... you should lend me some hahaha. I'm impartial to both spots and stripes! Yes polka dots! It got to the point for me where I had to ban myself from buying them for a while because I already had polka dots on just about every type of garment. I love stripes too, but really only for shirts, whereas I will happily do dots on anything and everything! I gravitate towards spots and dots.. I prefer shirts and jumpers but I must admit I do own a couple of polka dot dresses.. I love a good spotty jumper! Another charity shop find! Although it's not vintage, it's from Mango but it's SO SOFT. Same! I can't get enough of them. Totally. Although I'm really careful about wearing them, polka dots can look a little childish.. Spots are adorable and way more fun than stripes.. stripes are a bit too formal for me.. I don't own a single piece of striped clothing.. I just don't suit them I guess. I had to have a look on my rails to see that I own nothing with spots after reading this post!! How? I really like how short and sweet your blog posts are! I would love to write posts this short sometimes. You can't beat a good polka dot!! Polka dots are the best! Dress it up, casual it down... sweet but still with a bit of edge. It's a winner! Polka dots make any outfit fun! Its a great way to add patterns without it being overwhelming.